“Where the Spirit of Christmas Lives Year Round.” The City of North Pole is located about 12 miles southeast of Fairbanks, situated between Ft. Wainwright and Eielson Air Force Base. The City of North Pole has a population of approximately 2,100 people, and serves at the commercial hub of the Greater North Pole area of approximately 30,000 residents. 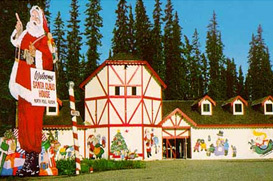 North Pole is home to the world famous Santa Clause House, where Santa and his reindeer reside year-round. The theme of Christmas spills over into the rest of the city with local stores and restaurants boasting Christmas decorations throughout the year, appropriately named streets, and candy cane shaped light posts to complete the picture. Make North Pole your home! We have a team of buyer specialists that can help you buy a new home, townhouse or condo in North Pole. And, if you are selling a home in North Pole, Madden Real Estate can guide you through the entire process with a customized marketing plan. We offer free home buying tools that will give you the information you need to successfully buy North Pole real estate. And our buyer specialists are experts in guiding you through the myriad of North Pole homes for sale until you find the perfect property for you and your family. If you are interested in North Pole foreclosures, North Pole REOs, and North Pole bank-owned properties, you can find them through the Madden Team. Our North Pole real estate agents and North Pole Realtors provide professional service that is hard to beat, and our team has connections to help you find home loans and mortgage information that will fit your needs. The North Pole real estate market is competitive, and you will want our team of real estate specialists on your side.